Working in their clandestine laboratory in a remote location on the fringes of L.A. County, The Bolides are four scientists experimenting with the physics of rock. Using the binding properties of atomic power, they fuse the periodic elements of garage, keys, pop and punk to create a new concoction never before seen or heard. 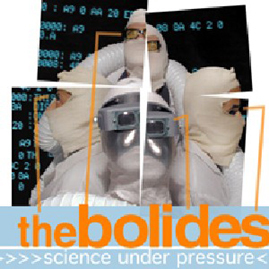 Their 12 song debut Science Under Pressure is rife with lyrics that take a degree of I.Q. to imbibe. But don't be intimidated by their intelligence. The Bolides are the sound of the future, a future you'll be glad to be a part of. Produced by Lee Joseph.